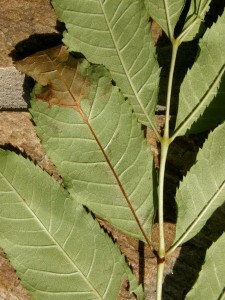 Much has changed since the trade-related arrival of ash dieback (Chalara) at a nursery in Buckinghamshire, England, in February 2012. On the negative side, 652 sites across England, Scotland and Wales are now known to contain trees infected with the potentially fatal disease. Also, it is now accepted that the spread of the disease cannot be stopped. There is hope for treatments, but they are currently still in the development phase and their wider ecological implications are unknown. Assuming therefore that ash dieback will run its course and take its toll, the estimate that the UK will lose at least fifty species identified as solely relying on the ash for their survival is tragic. On the positive side, Hymenoscyphus fraxineus, as the pathogenic fungus from East Asia that causes Chalara is now called, has spurred science and policy in the area of tree and plant health into action. Some of these actions are considered below. Yet much remains to be done. Protecting tree and plant health remains a concern firmly embedded in the science-based, technocratic discourse of ‘biosecurity’ with its emphasis on regulation, surveillance, and control. This makes a broader debate of the deeper, more complex causes of the steep rise in tree and plant disease epidemics worldwide very difficult. Plant science – after decades of neglect and the underfunding – and plant health have moved up a notch on the government’s agenda since the arrival of ash dieback. This has not least been due to the public outcry and media response that accompanied it; the media was flooded with apocalyptic imaginaries of a British countryside under siege from non-native pathogens and pests set on changing its face forever. A case of ‘social amplification of risk’ (Pidgeon and Barnett, 2013) it might have been, but a case the government could not ignore. In November 2012, it convened a COBR emergency meeting in London on ash dieback. This was followed by the setting up of a Tree Health and Plant Biosecurity Expert Taskforce whose final report was published in the record time of only seven months. One of its key recommendations was the appointment of a Chief Plant Health Officer: Professor Nicola Spence took up her post in April 2014. Another recommendation was the compilation of a UK Plant Health Risk Register that can will be used to prioritize action against pests and diseases that threaten the ‘crops, trees, gardens and countryside of Britain’. The government has also allocated seven million pounds to a multi-disciplinary Tree Health and Plant Biosecurity Initiative (THAPBI) that aims to generate knowledge about tree pests and diseases and how to tackle them. Interestingly, the idea that the social sciences could play an important role here required special emphasis. It was an idea first expressed in the Tree Health and Plant Biosecurity Action Plan of 2011, and reiterated in a policy briefing note in 2013. The relevance of socio-cultural aspects of plant disease epidemics obviously so far did not seem that relevant to the science-based, technocratic approaches to ‘biosecurity’. Although science has been opened up in novel and experimental ways in response to Chalara, interpreting this as a democratization of science or a ‘making science public’ might not be quite correct. Rather, I would hazard, it was the sense of panic and the urgency to act experienced when ash dieback struck together with the realization that expertise in the field of plant pathology in the UK had become a very scarce commodity indeed meant that the time was ripe to get all the help available. This meant inviting scientists internationally and publics locally to lend a helping hand. In 2012, the BBSRC funded scientists at the John Innes Centre, Norwich, to collaborate with scientists around the world through an ‘open source’ platform that enabled the sharing of data and speeded up the publication of results. In 2013, OpenAshDieBack was described as: ‘an unconventional step of rapidly generating and releasing genomic sequence data. We released the data through our new ash and ash dieback website, oadb.tsl.ac.uk, which we launched in December 2012. Speed is essential in responses to rapidly appearing and threatening diseases and with this initiative we aim to make it possible for experts from around the world to access the data and analyse it immediately, speeding up the process of discovery’ (MacLean et al, 2013). Another way in which the science of Chalara was opened-up was through the Facebook-based crowdsourcing game Fraxinus, developed by Dan MacLean from the The Sainsbury Laboratory. It presents players with real reference DNA sequences from the ash tree genome and challenges them to match up multiple DNA sequence reads from other samples against that references. The objective is to identify regions of the genome that show characteristics such as resistance, which might then be bred into a new disease-resistant variety of ash tree. Similar to OpenAshDieBack, Fraxinus enables ‘lots of people to lend a hand’. In the five months between August and December 2013, 51,057 people played Fraxinus, and the website confirms that ‘we have gained new biological insight into the variants selected from sequence data analysis’. Surveillance is a key principle of biosecurity, and citizen science has played an important role in the monitoring of the spread of ash dieback. The Living Ash Project, for example, is a five year initiative funded by Defra that invites the public to get involved in monitoring Chalara. The smartphone app AshTag, developed by the Adapt Low Carbon Group at the University of East Anglia and launched in October 2012, also enables people to record diseased trees and submit photos of them to experts for assessment so they can map the disease pattern across the UK. Another way in which citizen scientists can help monitor tree diseases is through the Open Air Laboratories (OPAL) network. All these initiatives have the following characteristics in common: monitoring, surveillance, and control. At the beginning of November, I participated in a focus-group on public acceptability of genetic solutions to ash dieback. The interview formed part of a study led by Dr. Paul Jepson at Oxford University. The issue of genetically modified trees as an answer to ash dieback has since hit the headlines. It is an answer that could have only been given in response to a question that sees plant health as a problem of biosecurity, a problem to be tackle through scientific, technological, and regulatory approaches. And yet this framework has received much criticism from social scientists in recent years. Especially Biosecurity Borderlands, a project based at Exeter University, has done much to show how biosecurity (in the field of zoonotic disease) interfaces with other concerns in a globalising world. It is these interfaces we now need to turn our attention to. This is the only way to open-up to public and political debate links between trade liberalization, inadequate national and international regulatory frameworks, unsustainable horticultural trading practices, and damaging cultural preferences for gardening practices and their role in fostering epidemics (Tsouvalis, July 2015). The social sciences and humanities are ideally placed here to ‘lend a hand’! I’ve superficially read the Borderlands report and it feels a little wishy-washy to me. “Seeing Asian Hornets? That’s ok, we’ll wait until the tipping point” is not an argument that is likely to win people over. The benefit of borderlines is that they are are clear, and the actions required once breached can be defined. In contrast, borderlands give invaders a chance to get a foothold and muddy the waters regarding the correct response.